Harriet Holmes, Evelina’s neighbor, continued to be quite ill. Evelina and others looked after her, including an aunt who departed her post before a new helper arrived, earning Evelina’s stern disapproval. As Harriet had a toddler, Willie, to look after, the aunt leaving her alone was not only “unfeeling,” but negligent. Help was on the way. Harriet’s husband, Bradford, drove a team – of oxen, most likely – to Canton to fetch his mother. 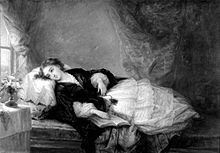 Before they returned, Evelina made fresh the sickbed, as she had done on other nights. Harriet would be tended to. And this morning, even as Jane McHanna wrestled with the weekly wash, a “new girl” entered the Ames household to help with the chores and the sewing. That must have brightened Evelina’s Monday. * Louis Lang, The Invalid, 1870, oil on board, Brooklyn Museum of Art, Gift of Mrs. Walter deForest Johnson. I wonder if Julia Waters is related to Asa Waters, the Revolutionary War vet, who ran the hoe shop etc. while Old Oliver was in Plymouth during the War of 1812. He had a much younger, (second wife,) widow, who may have been the last widow standing with a survivors pension from his war service. I have no idea who Julia Waters was, and your supposition is quite plausible. This is the only time she appears in the diary. Thanks, Dwight, for the extra insight. Well, she certainly wouldn’t be his widow, whose name was Lucy, and we have records of her selling/trading Dunstable cloth- straw weave braid to Samuel Hodges in 1812-13. But there were other branches of the Waters family in the area. Deborah Sampson had Waters’ connections and supposedly stayed with Uncle Zebulon on Bay Road for a time before her Rev. War enlistment. We also have the hand-written reminiscences of Capt Asa (who also lived on Bay Road) re: his service including fortifying Dorchester Heights. In any case the Old Oliver – Asa Waters relationship has interested me since the time I learned about it. In this case, Asa would have been the older man. I have no idea how they first made connections, but I would like to.